We’ve covered recording software quite a bit over the past few months, taking a look at both the top inexpensive options as well as the best-of-the-best in digital audio production. And while we can’t in good conscience crown a single DAW king, we can further look at the best recording software available for music production. One thing to keep in mind is that all DAWs function in roughly the same way. At the very least, you’ll be able to sequence MIDI, track and edit audio, and mix your material with any software you choose. It’s the different workflows between DAWs that will likely dictate which software you choose. For instance, FL Studio has an incredible workflow for producing beats, while Pro Tools’ industry-leading capabilities make it a clear choice for tracking, editing, and mixing audio-heavy sessions. So, there really isn’t a single best recording software. Whatever you choose, learn it, and learn it well! As the latest iteration of Avid’s gold-standard DAW, version 2018 introduced a host of new features formerly not present in Pro Tools 12. With a keen focus on making MIDI production faster and easier than before, Avid created a slew of intuitive key commands for editing MIDI on the fly, in addition to retroactive MIDI recording that captures your performances before you even hit record. Pro Tools 2018 also brought about handy track presets for rapidly building sessions, and convenient channels strip EQ curves to quickly survey an entire mix. The industry-leading DAW shows no signs of slowing down. If you’re still hunting down your first DAW, Pro Tools is a major contender. As a purely personal preference, I would consider Pro Tools to be the best recording software available. On par with Pro Tools in terms of popularity and use in the professional arena, Apple’s Logic Pro X remains one of the best choices for audio production in 2018. The software comes packaged with some of the best stock plugins of any DAW and a massive collection of virtual instruments, all within a functional, intuitive interface. 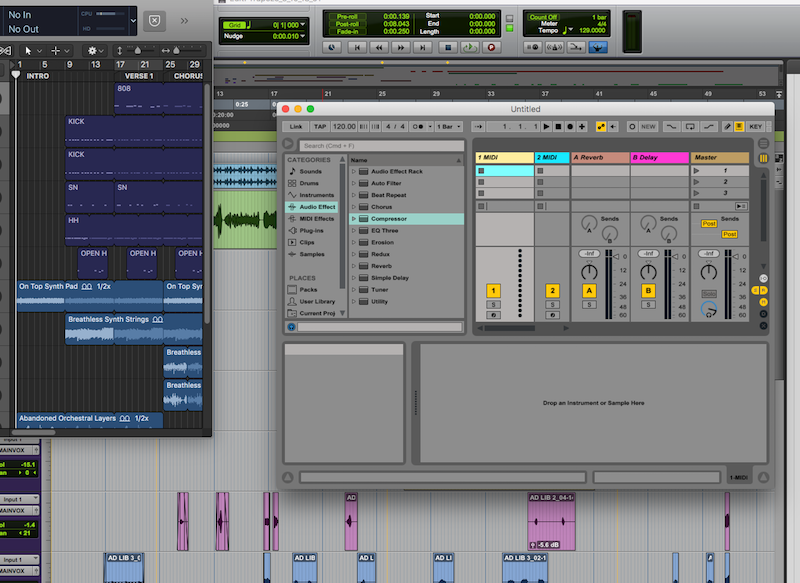 Though it does alienate Windows users, Logic is nonetheless a stellar choice for making music on Mac OS X. A longtime go-to for electronic music producers, FL Studio 20 is the brand new version of Image Line’s popular workstation, released May 21, 2018. The version comes with full support for Mac operating systems, previously being a Windows-only software, in celebration of FL’s 20th birthday. FL Studio 20 provides one of the best piano roll editors in the game, which proves quite useful for producing modern electronic music. However, purchasing a “Producer” or “Signature” package of the DAW allows unlimited music production potential. Ableton Live is another popular choice amongst electronic music producers based on its MIDI sequencing capabilities, though it’s a great all-around DAW in general. There are 3 versions of the software, each at different price points. Depending on which one suits your needs, Live 10 comes equipped with up to 5000+ samples/loops, 13 virtual instruments, and 41 plugins. Cubase, now in its 9th version, is the culmination of nearly three decades’ worth of Steinberg’s design and development expertise in music production. A cutting edge, highly capable DAW, Cubase is utilized by a variety everyone from hip hop producers to film composers, and everyone in between. Cubase’s sound quality is touted as industry-leading, and its intuitive handling reduces the learning curve. If you’re after a fully capable, all-around DAW, look no further. PreSonus Studio One 4 is another great choice, brand new for 2018, offering a complete DAW experience. Sharing in Logic Pro X’s intuitiveness, Studio One keeps the artist in mind; not everyone wants to be an engineer, after all! Features like “Arranger Track” and “Scratch Pad” allow users to make quick adjustments to arrangement or audition composition changes without committing to them. This makes Studio One great for composers working with dense arrangements. Additionally, Impact XT and SampleOne XT are new virtual instruments in version 4, intended for beat-making and loop-based composition. Often unmentioned in the list of “major” software, Reaper is an incredibly inexpensive, fully-functioning DAW. Its efficient 64-bit internal audio processing engine supports media in almost any format at any bit depth and sample rate. Frankly speaking, anything your favorite DAW can do, Reaper can do too! Though it doesn’t come with any of its own virtual instruments, Reaper of course supports plugins and instruments in nearly every format. Recording, mixing, MIDI’ing, automating, and what have you. It’s all there, and at a price that’s hard to ignore, making it some of the best recording software for the money. Harrison is perhaps best known for designing and manufacturing full-format consoles since 1975, with over 1500 currently installed globally. Before the company’s inception, consoles designed by founder Dave Harrison saw action on AC/DC, Queen, and Led Zeppelin albums. Harrison Mixbus “is the first full-featured DAW with true analogue-style mixing.” Among the lengthy list of industry standards, Mixbus uniquely emulates the analogue circuitry found in Harrison consoles. The DAW also uses a stereo bus with tone controls and analogue tape saturation. If a digital workspace with practical, analogue-style features is what you’re after, Mixbus is a good shout. If you own an Apple computer or mobile device, you also own Garageband. For $0, it’s a surprisingly capable DAW (that is, if you already own an Apple computer!). A stripped-down version of the professional DAW Logic Pro X ($199), Garageband is the perfect place to tinker with tracking, MIDI, and mixing before taking the plunge with weightier software. Its intuitive design makes it easy for beginners to jump in and test the waters. One of the most popular open source programs for many years running has been Audacity. Currently on version 2.3.0, Audacity is compatible with Windows, OS X, and Linux operating systems, ensuring access for all users. If multitrack recording and editing seems like it’s for you, try it out with Audacity before dropping the dough on expensive software. Like we said, some of the best recording software is totally free!